The beginning of the Carboniferous Period, 360 million years ago, was a time of expanding horizons for all terrestrial life. Plants were extending their domain in all directions, gaining ground and pushing out farther from the shorelines of the oceans, lakes, and streams where they originated. Insects and other arthropods were thriving in the vast vegetative coal forests that accumulated around the coastal plains. The annual climate was so evenly temperate that there were no distinct seasons. Tree rings, which are caused by pauses in seasonal growth, are absent from fossil trees from the Middle Carboniferous. Into the humid, swampy habitats of the Carboniferous walked a variety of early tetrapods, the first amphibians. Because the fossil record for early tetrapods is spotty going into the Carboniferous, the roots and connections for many tetrapods known from this period are unclear. Even so, the variety and diversity of Carboniferous tetrapods is hard to deny, and their success is marked by an apparent radiation into several ecological niches, where they immediately dominated as top predators. In geologic terms, their reign would be short, however; it was curbed by the rise of early amniotes (reptiles) in particular during the beginning of the Permian. The legacy of these early tetrapods survives today in the taxonomic group Lis-samphibia: modern-day amphibians, including frogs, toads, salamanders, and caecilians. Following are representative families and members of the early tetrapods. Crassigyrinidae (Early Carboniferous). Enigmatic and peculiar are words often used to describe the lone member of this clade, Crassigyrinus, whose names means "shallow wriggler." Found only in Scotland and known from three skulls and a nearly complete skeleton, Crassigyrinus was about 6.5 feet (2 m) long, with extremely short limbs, a long, finlike tail, and a large skull that alone measured about 14 inches (35 cm) long. This puzzling, eel-like creature with tiny legs seems more like a fish than a tetrapod, yet characteristics of its skeleton and limbs clearly show that its most immediate ancestors were fully limbed amphibians. Crassigyrinus apparently evolved from a lineage of tetrapods that after many generations on land actually returned to specialize for life in the water, making it secondarily aquatic from the standpoint of its evolution. Evolution does not always go in one direction. Whatcheeriidae (Early Carboniferous). This recently discovered family of tetrapods includes two genera, each measuring about 3.5 feet (1 m) long. Pederpes, from Scotland, was described by Jennifer Clack in 2002 based on a nearly complete skeleton held in the collections of the Hunterian Museum, Glasgow, since 1971. Although originally it was misidentified as a fish, further preparatory work on the specimen nearly 30 years later revealed that it had legs. Clack immediately recognized a significant new twist in the orientation of the legs of Pederpes when the specimen was compared to other Late Devonian tetrapods. Instead of having bony fins pointed backwards, up, or to the sides for paddling, Pederpes had limbs that were oriented so that the animal could swing its feet forward for walking. "The locomotion of Pederpes is quite different to what went before," notes Clack, explaining that later tetrapods continued to improve on this forward-swinging bone configuration. Equipped with five functional digits on its forelimbs and feet, Pederpes is the earliest known tetrapod to depart from the fin and paddle design of Late Devonian tetrapods. This makes Pederpes the earliest known vertebrate equipped primarily for terrestrial locomotion. Even though Pederpes might also have had a sixth tiny finger on its forelimb, it appears that the whatcheeriids were beginning to settle on five digits as the optimal number for walking on land—a pattern that would stick in most other lines of tetrapods throughout the Carboniferous and beyond. Pederpes and its slightly younger relative Whatcheeria (discovered in 1995 in Iowa) are the best-known tetrapods marking the early part of the Carboniferous Period. 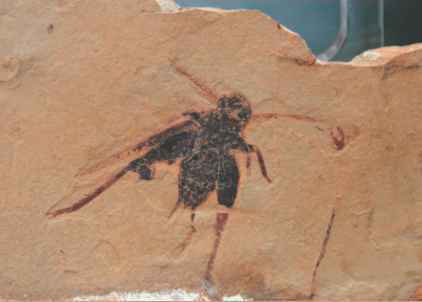 Baphetidae (Carboniferous). This tetrapod group is known mainly from the skulls of four genera; little is known about their postcranial remains. The skulls were broad and flat and shaped somewhat like the head of a shovel when viewed from above. The jaws were lined with rows of pointed teeth, suggesting a diet of fish. The roof of the mouth was fitted with additional, longer, fanglike teeth in some genera, such as Megalocephalus. The skull openings for the eyes of the baphetids were somewhat irregular and shaped almost like keyholes, with an extension of the orbit just in front of where the eye would have been. This additional surface may have been a place for the attachment of powerful jaw muscles. Megalocephalus had a blunt snout, flattened skull, and eyes that protruded out of the water while the animal was submerged. snout, a flattened skull, and eyes that protruded out of the water while the animal was submerged. Baphetes (England) had a slightly elongate, shovel-shaped skull measuring 11 inches (29 cm) long. Colosteidae (Carboniferous). The colosteids are one of the best-known tetrapod groups from the Early Carboniferous. They included medium-sized amphibians with salamanderlike bodies. Growing up to four feet (1.5 m) long, the colosteids had short legs and long, low, and flat skulls. They probably were largely aquatic, feeding on fish. The colosteid skull was somewhat like that of Acan-thostega. A distinctive feature was a pair of tusklike teeth located in the front upper jaw. These tusks were accommodated by a notch in the lower jaw. 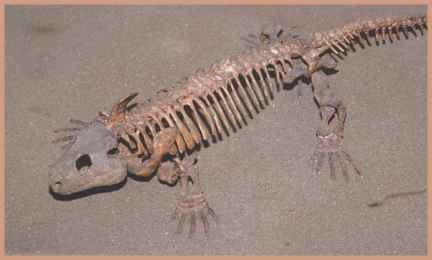 Colosteids might represent an early branch of the primitive amphibians, also known as temnospondyls. Notable genera of colosteids include Greererpeton and Colosteus from North America. Dendrerpeton (Late Carboniferous). The genus Dendrerpeton (Late Carboniferous, Nova Scotia) was a basal amphibian and one of the earliest to show strong affinities for life on land. It had strong limbs and sturdy hip and shoulder girdles and was about 40 inches (100 cm) long. The stapes bone in Dendrerpetons skull was oversized; it probably was used for structural support rather than for hearing, but the presence of this bone is an important link to later tetrapods in which the stapes became part of the ear. Specimens of Dendrerpeton are often found inside fossilized tree trunks; this attests to its terrestrial habitation. Aistopoda (Early Carboniferous to Early Permian). This small group of legless amphibians is classified with the tetrapods. Despite the fact that aistopods had no limbs, traits such as the structure of the backbone shared affinities with other groups of tetrapods. Snakelike in appearance, aistopods evolved long before the first snakes and were unrelated; however, the aistopods may have filled an ecological niche similar to that of snakes. It is presumed that the ancestors of aistopods had limbs and made the curious adaptation of a legless condition for whatever advantages it provided this line of tetrapods. The aistopods grew up to three feet (100 cm) long. Leth-iscus and other members of this taxon illustrate the great diversity of the Carboniferous radiation of amphibians and their adaptations to a variety of lifestyles. Anthracosauria (Early Carboniferous to Early Triassic). This group includes several small- to medium-sized reptilelike amphibians that are thought to be more closely related to amniotes than to other early amphibian lines. The bodies of these animals were generally long; some forms were more terrestrial than others. The skulls retained some of the weaker, less fused structural features of lobe-finned fishes. Proterogyrinus (Early Carboniferous, West Virginia, Scotland) had a long, scooping mouth lined with small, pointed teeth for snatching fish. Its vertebral column, ribs, and limbs were more than adequate for trekking on land, but Proterogyrinus also retained a tall, flat-sided tail that would have enabled it to swim effectively. Pholiderpeton (Late Carboniferous, England) appeared to be at home in the water. It had short limbs; a broad, flat tail; a short neck; and an elongate, crocodilelike body. Nectridea (Late Carboniferous to Permian). The Late Carboniferous and Early Permian Periods marked the height of amphibian diversity and dominance of world terrestrial habitats. Amphibian tetrapods had expanded in many directions at once, using a diversity of body forms, although most still were dependent on being near water to breed. While many taxa became increasingly adapted for the land, some tetrapods found great success by remaining mostly aquatic. The nectrideans were among those. Sauropleura (Late Carboniferous, Europe and North America) was among the more salamanderlike forms of nectrideans; it had a long, flattened tail for swimming. The vertebrae of the Sauropleura tail were unique among early tetrapods: These vertebrae had large, symmetrically designed bony elements above and below the hollow channel that housed the notochord. Clearly distinguishing Sauropleura from present-day salamanders were the presence of rows of sharp, pointed teeth in the upper and lower jaws. 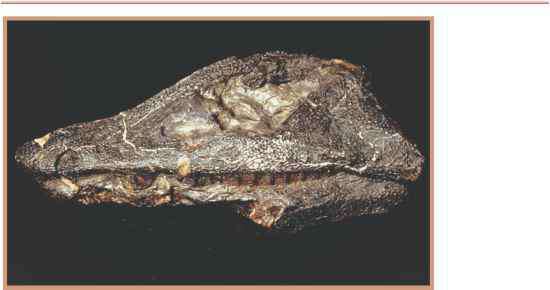 Among the best-known nectrideans is Diplocaulus (Late Carboniferous and Early Permian, Texas). Remains of these animals that represent several growth stages have been found. Measuring about three feet (1 m) long, Diplocaulus had body protuberances on either side of its flat skull; this gave it a decidedly boomerang-shaped head. The body was broad but flat. One can imagine this robust predator resting quietly on the bottom of a stream, holding its breath and waiting for prey to swim above. Diplocaulus had a relatively short tail for an aquatic tetrapod; five toes on each fore-limb and hind limb; a wide, gaping mouth; anteriorly positioned nostrils; and eyes that faced upward. The animal's boomerang skull was nearly as wide as the trunk of its body was long. The unusually shaped skull probably aided the bulky swimmer as it glided through the water, providing lift much as an airplane wing does. The wide skull with its pointed wings would have been difficult for a predator to swallow. This probably discouraged some potential attackers from snapping at the head of Diplocaulus, although the trunk of its body was certainly vulnerable and would have made a substantive meal without the head. Eryopoidea (Permian). This was once a group containing many forms of early amphibians that had been difficult to place anywhere else in the lineage of early tetrapods, but the eryopids have since been reduced by further study to two families based on the bony structure of their nasal passages and hips. While most members of these families appear to have been largely aquatic, the best-known genus is the large, terrestrial animal known as Eryops (Early Permian, United States). Eryops was large. It measured up to eight feet (2.5 m) long and could crawl with relative ease across the fallen trees and swampy terrain of its habitat. Fossils of Eryops were common enough that for many years it was the most featured early amphibian in the world's leading natural history museums, forming a picture of the first tetrapods as large, hulking brutes. Recent discoveries, many of which are outlined in these pages, now provide a more complete picture of early tetrapod design and make Eryops, with its massive limbs and skeleton, less typical of the amphibians that dominated the Late Paleozoic Era. Seymouriamorpha (Permian). This taxon and its best-known member, Seymouria (Late Permian, Texas), includes the most reptilelike of the early tetrapods. The affinities of the group with the first reptiles—the first amniotes—include legs that are more robust and locomotive than those of most early tetrapods and a vertebrae design that anticipates that seen in amniotes, which also were appearing during the same time span. The skull was taller than that of most early amphibians, and the upper jaw was equipped with fanglike teeth. Seymouria has been known since the 1880s, and most paleontologists considered it to be an early reptile until more recent studies began to reveal more and more affinities with amphibians. The study of growth-series specimens in the mid-1990s showed that seymouriamorphs had an early aquatic stage with gills before they grew into their terrestrial form. This clearly marks Seymouria and its kin as amphibians. Nonetheless, Seymouria was one of the best adapted of the early terrestrial amphibians, and at a length of about 23 inches (60 cm) long, it probably was a fit competitor of the first reptiles. Seymouria was the most reptilelike of the early tetrapods.